Saturday was just one of those days when planning all goes down the drain. Everything was going so well: I did a yoga class in the morning, made a quick change at home, drove to a movie theater in another town so I could see the newest Met Live in HD Opera broadcast and made it with 10 minutes to spare.... *que screeching halt sound* ... but then the opera was sold out. And I had already paid for 4 hours of parking in preparation for said opera. So, with no plans and no experience getting around New Rochelle, I set out with my trusty iPhone 5 and just started to walk. When one plan falls through, there is always an opportunity to find an unexpected adventure! Instead of sitting inside watching what I'm sure would have been a breathtaking opera, I found some parks that looked to be right along the water (this area is on the Long Island Sound) so I thought I would take advantage of the continuing mild weather and see some waves. 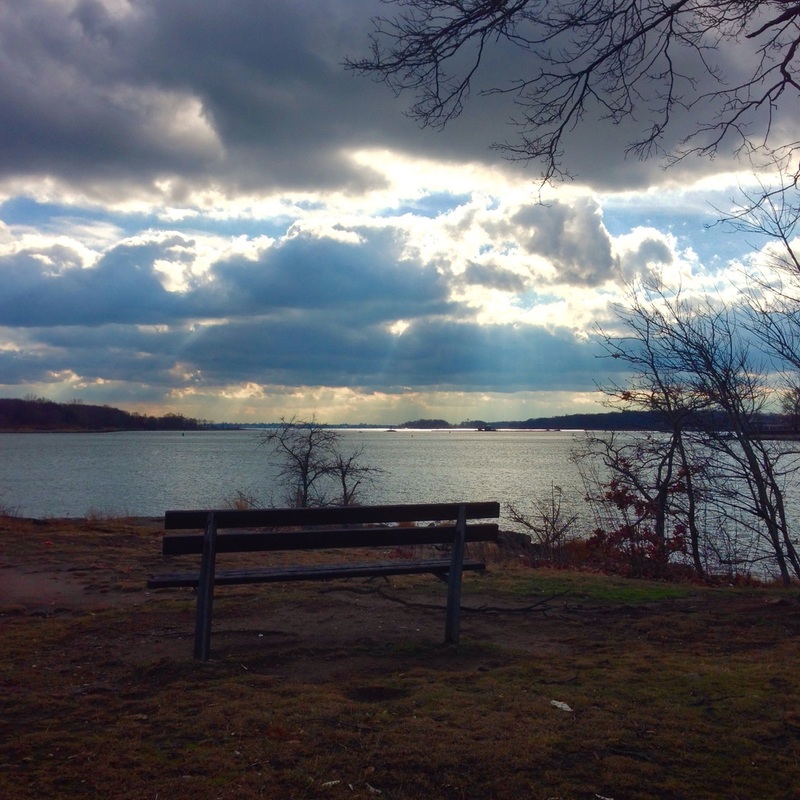 My first stop was Davenport Park, a 20-25 min walk from downtown New Rochelle, NY (or 5 min drive, they have a parking lot). 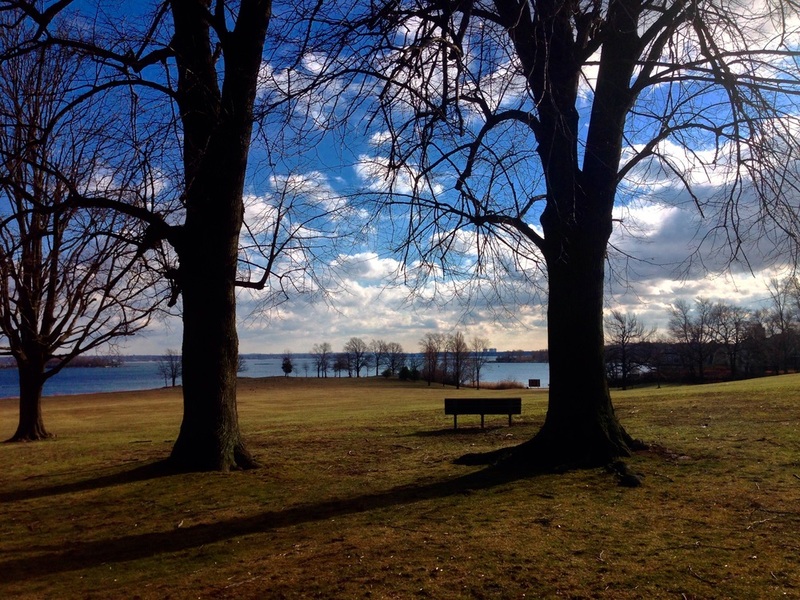 This interesting 20-acre park just looks like a long, sloping field at first, but when you get right down to the edge of the water, you will find a great set of rocks. 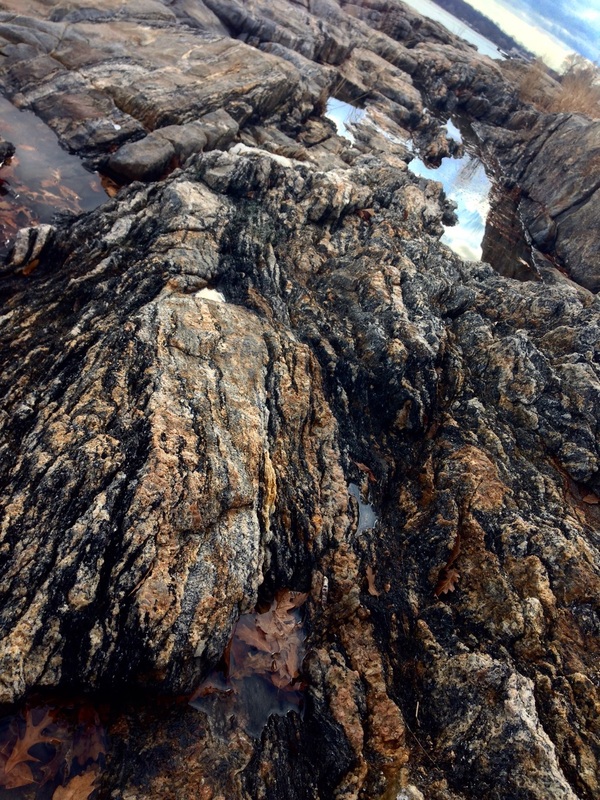 A lot of the rocks in Westchester county have quartz marbling, so that combined with the interesting shapes carved out by years next to the waves of the Sound made for some fun textures. I recently saw that a friend of mine has a line from "Purple Haze" by Jimi Hendrix tattooed on his arm: "excuse me while I kiss the sky". 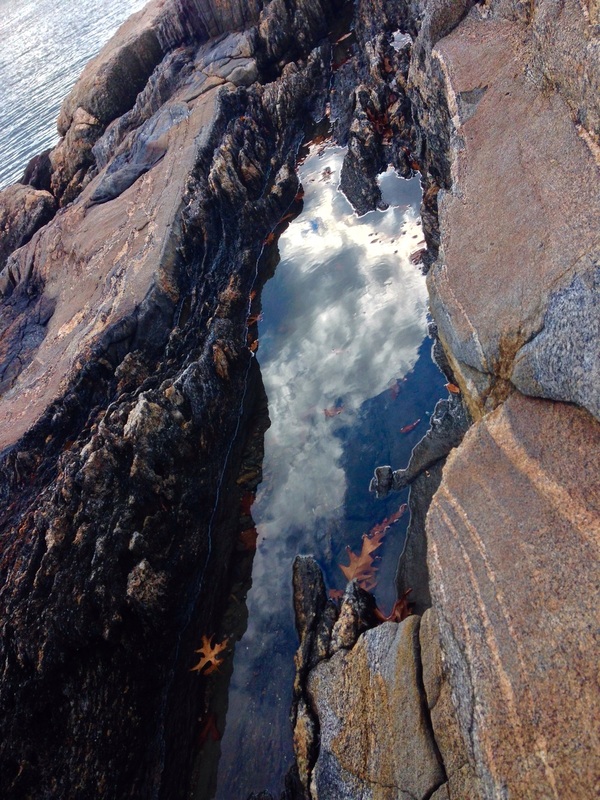 That line kept coming to mind as I tried to capture the clouds overhead reflected in the small tidal pools. Not to be overly nerdy for a minute here, but have you ever found a marker kind of like this stuck into a rock or trail when on a hike somewhere? They are called benchmarks and are used to record survey data of an area. The majority are tracked by the the National Geodetic Survey (NGS) but others have been placed by the US Corps of Engineers, like this one. If you're ever curious and want to learn more about where to find these interesting little spots, check out the National Geodetic Survey Data Explorer map. There is a hobby based around finding and logging these markers called "benchmarking" if you really want to get into it, but for me, I'll just stick to the occasional accidental find. There is something so calming about just sitting down and enjoying the sound of crashing waves. I made my way out to the end of the outcropping and decided to enjoy the serenity for a while. The wind picked up and eventually it became a bit too chilly to be enjoyable but taking in the view from this spot was definitely worth it. If you're ever in the area in the spring or summer I highly recommend taking a minute to relax and explore these rocks! As I was leaving I found this little spray painted sign on a patch of the rocks... oops. If climbing over the rocks isn't exactly your thing, or you like to follow the advice of badly placed spray paint, there also happen to be a few conveniently placed benches for your viewing pleasure. After Davenport Park, I decided to stop by Hudson Park on my way back up into town. While the park itself doesn't offer the great views that Davenport does, it does have a pier called Duck Point and a beach that opens during the summer months. The most interesting thing for me was finding this sign about the Huguenots of New Rochelle. At 128 years old, this sign is probably one of the oldest things in the area. Also, knowing that at some point there was an entire Huguenot Association of just New Rochelle is pretty entertaining. 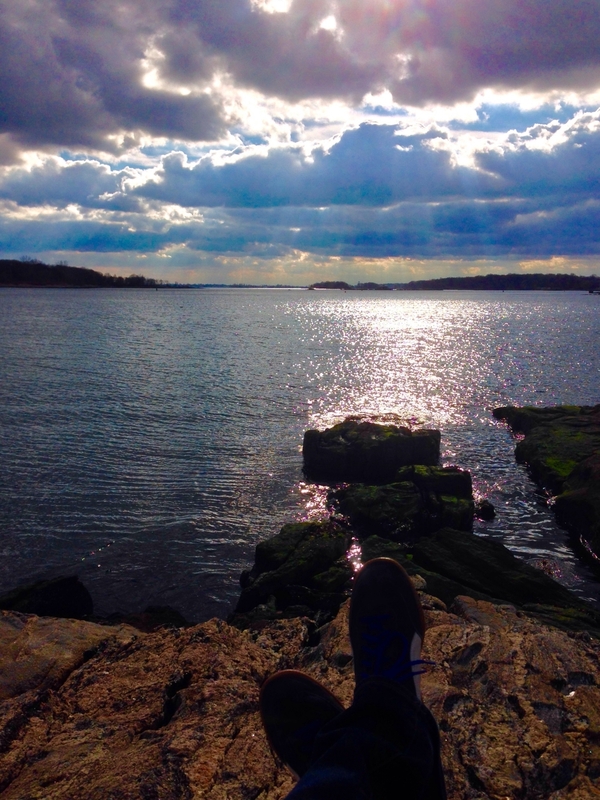 Thank you for coming on a casual stroll around the shores of New Rochelle with me, I hope this inspires you to keep your options open if plans ever fall through and to remember that adventure is always around the corner if you're willing to look for it. Thank you for subscribing to the Adventure Blog! Check your inbox for future posts.